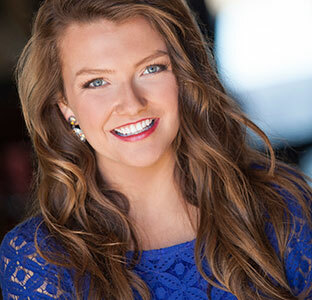 (March 10, 2015) -- Emma Faye Rudkin, communications major and UTSA Honors College student, was crowned Miss San Antonio 2015 at the recent Miss San Antonio / Alamo City Scholarship Pageant, the official preliminary to the Miss Texas and Miss America Scholarship Pageants. A first-time beauty pageant winner, Rudkin, 18, will represent San Antonio and the surrounding area the Miss Texas Pageant in June alongside the seven other queens crowned at the pageant on Feb. 21. Rudkin is a trained pianist, guitarist, ukulele player and singer-songwriter. According to her Miss San Antonio profile page, she has performed all across San Antonio in coffee shops, restaurants and the San Antonio Rodeo. In addition to being an accomplished musician, Rudkin is also a member of the National Society of Collegiate Scholars, the UTSA Honor Roll, an award-winning photographer, and published writer. After graduation, Rudkin hopes to attend a Christian seminary and continue advocating on behalf of the deaf and hard of hearing community. To read her story, visit the Aid the Silent website. The Miss San Antonio Pageant was founded in 1927 and in 1932 became associated with the Miss America Organization, which provides young women an opportunity to further personal and professional goals and instills a spirit of community service through a variety of unique national and community based programs, according to the organization’s website.